There is one tough perennial blooming in my garden right now. Actually, there is a whole bunch of them. 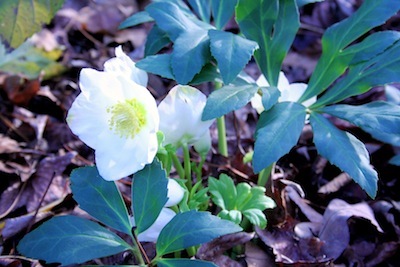 There are pink and spotted white hellebore hybrids (Helleborus x hybridus) known as Lenten Roses, and one Christmas rose (Helleborus niger), which is white. The Christmas rose is hardy to USDA Zone 4 but most of the other hybrids are Zone 5-9 plants. They have been blossoming since December and continue on today. That is one of the beauties of these lovely shade plants. Another is their versatility. You can plant these winter flowers in full shade. Deciduous shade works really well in my garden. They have full shade during the hottest part of the summer and full to mostly sun in the winter. They also do well in part shade or even mostly sun as long as they have plenty of moisture and mulch to keep the roots damp and cool. Overhead trees and perimeter shrubs help to shelter the plants from strong winds. Hellebores are evergreen in almost all areas of the country, except for the very coldest parts of their range. In the ground or in a container, be sure to use good soil with a slightly alkaline to neutral pH. Work lime into your soil every year around the plants if you garden in acid soil. This not only will give you healthy plants but also will help seeds that drop nearby germinate. This is one of those plants that deer leave alone most of the time. As an evergreen groundcover, the hellebore hybrids (Helleborus x hybridus) (In the past, these were called Helleborus orientalis.) are a sure winner. They were the Perennial Plant of the Year in 2005. They will self-seed to become large clumps. You can move the seedlings but the mother clump will resent efforts to divide her. These are not long-lived perennials, so keep seedlings coming along to replace your main plantings. 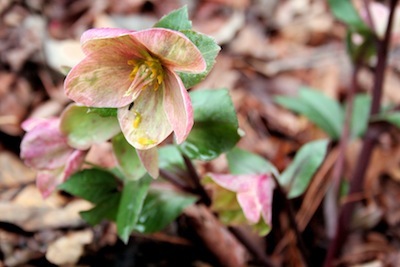 Last year I found a couple of the new hybrids (Helleborus x ballardiae) at a Home Improvement store’s garden center. I not only brought home several ‘Pink Frost’ but also ‘Cinnamon Snow,’ another in the Gold Collection® from Skagit Gardens. I wrote about ‘Pink Frost’ at this GardenSMART page: http://www.GardenSMART.com/?p=articles&title=Lenten_Rose_Pink_Frost. They often will blossom in their first year. They stand straighter and are somewhat showier just because the color is almost as vivid on the back of the face as on the front. They also have more finely cut foliage and a dusting of silver on the leaves. All hellebores not only thrive in a shady garden, they also will do very well in a container. This is a great way to display the blossoms in snow country, where drifts might cover the new flowers. You can always highlight a container near an entry and keep it free of snow. To renew the plants, I like to remove the old foliage just as the buds are forming in the fall/winter. The flowers open while they are quite short so taking out the old foliage gives the flowers more time to shine. As new leaves unfold, the flowers stretch above it all. Lenten roses and Christmas roses aren’t really roses at all. But, you might just love them as much in your winter garden as you do your roses of summer.